Whether you want to be a coach, athletic trainer or simply remain a part of the sport you loved playing, a graduate assistantship can provide you with valuable experience while you study. If you watch collegiate sporting events, then you’ve likely seen graduate assistants in action. They aren’t the ones calling the plays or playing in the game. They might, however, be the one rushing over to hand the coach the clipboard at a timeout. Graduate assistants are all around courts and fields, working tirelessly behind the scenes to ensure that athletes and teams all operate smoothly. They have a variety of responsibilities that they must balance alongside their school studies. They are often the oil that makes the entire machine run smoothly, making life easier for both the players and the coaches. Georgia State women’s basketball assistant coach Katie Pate has seen firsthand how hard the graduates must work and all that they contribute to the team. “It’s arguably one of the most thankless positions in collegiate athletics,” Pate said. “Graduate assistants, no matter the sport, are in the trenches and I think [our graduate assistant] is really finding her way about the degree of willingness that is required to take advantage of the experience, good and bad, that you can learn as a graduate assistant. And what a grind it is. 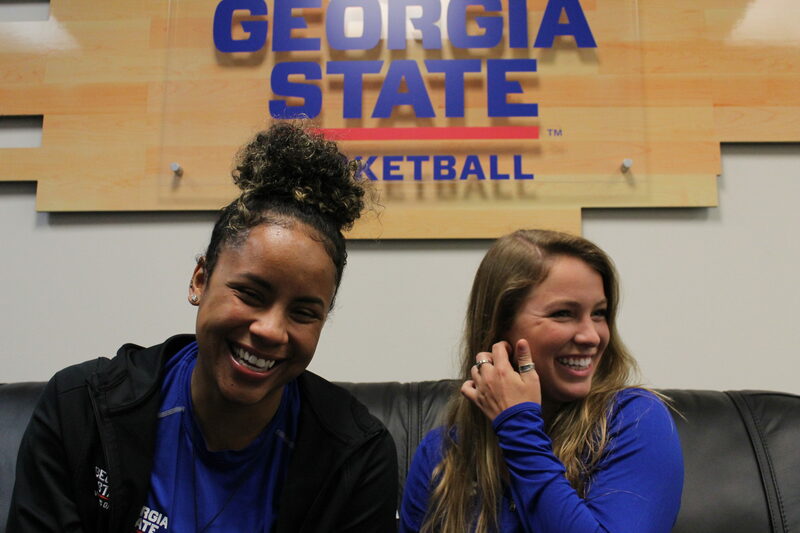 Georgia State women’s basketball graduate assistant, Mercedes Jorge, explained the various roles she serves on the team. Jorge played basketball her entire life and is working as a graduate assistant as a step toward her goal of becoming a head coach one day. She has a list of off-the-court duties as well as in-game responsibilities like handing the head coach the clipboard at timeouts. She also must order and retrieve pre-game meals, post on social media, book hotels and make other travel arrangements for the team. Graduate assistants are basically used for anything and everything that the coaches need on a day-to-day basis. On any given team, they may serve as equipment manager, staff manager, travel agent, graphic designer and communication specialist all in one package. Responsibilities vary greatly depending on the sport, staff and school. Some Georgia State teams may have several graduate assistants like football, while some teams may not have one at all, like baseball, beach volleyball and track and field. Some serve broad roles while others play very specific roles on the team, depending on each program’s individual needs. Dwight Anderson, graduate assistant for men’s basketball at Georgia College and State University, for example, has different responsibilities for his team. “My role just consists of learning from the head coach and the assistant coach, so going through everyday basics such as practice planning and talking about recruiting. They’ll also give me compliance paperwork to do, so like filling out the hour sheets for the preseason and when the regular season gets here,” Anderson said. Anderson also hopes to coach one day at the junior college level to help athletes whose grades didn’t meet Division I requirements. He played junior college basketball before getting a chance to play overseas in Germany and feels that he can better relate to people who go the junior college route. Just as graduate assistant roles vary, so do restrictions. Some grad assistants are encouraged to participate in the recruiting process while working within NCAA guidelines which only allow recruiting during certain months. Others are sidelined by their coaches and kept out of the recruiting process. The coaching staff largely determines the amount of flexibility their assistants have. Even with the heavy load and restricted access, some graduate assistants feel that the hard work pays off. Compensation varies by school and by team, but graduate assistants often receive stipends every month as payment. For others, the cost of tuition may be reduced or completely covered by the school, allowing them to gain a higher education without the higher cost. However, the most valuable part of the position is the experience, not the money. For those wanting to become a coach, it puts them at an advantage to serve as a graduate assistant first. Spending time working closely under head and assistant coaches can provide invaluable insight on the game and the world of coaching. If you do a good job, your coaches can connect you and refer you for potential jobs in the future. Many of the top coaches in college football began as graduate assistants. Kirby Smart, Nick Saban and Dabo Swinney all served as graduate assistants during their college days and coached 2017 College Football Playoff teams. This isn’t unique to football, and head coaches in every sport can begin learning the job firsthand as a graduate assistant. Though the coaching route is common, not everyone takes this path after graduation. Assistants may also use their experience for careers in other fields such as medicine, nutrition, communications, video and marketing. Being able to directly work with athlete injuries or compile press kits gives young professionals experience that they can list on résumés and market to future employers. Like many other entry-level jobs, graduate assistants are the low men on the totem pole and have to do a lot of the grunt work before earning their way up. However, the opportunity can be extremely valuable. It may be the first taste of working in their career field, or just a chance to remain a part of the game, but what they gain in experience can be enough to make it all worth it.